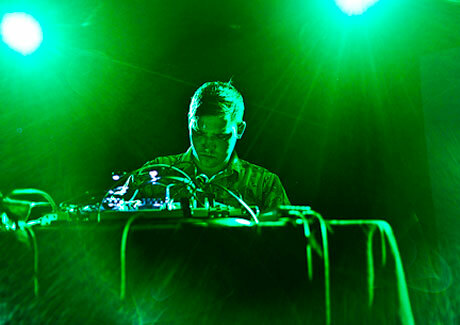 Vatican Shadow, who just released Ornamented Walls, often gets called dark ambient, which is only partially true. Knob-twiddler Dominick Fernow, also known for his work in Prurient and Cold Cave, is plenty dark, but live, there's little ambient about his music. After taking the stage after a sleepy, droning sound check — which lulled plenty into a false sense of security — Vatican Shadow unleashed an unrelenting, sweat-drenched noise assault. And we're not kidding: He barely stopped for a breath between songs, often crumpling on stage from exhaustion. There were few palatable entry points into Vatican Shadow's set. There was no subtlety. No layering. No theatrics. Instead, Fernow created music that recalled grinding steel, menacing war-chant loops and dense, pounding industrial. It was ugly, inaccessible and near-terrifying in its aggression — yet impossible to ignore. Fernow might have been the most challenging and attention-commanding act we caught at CMJ — no small feat considering the hundreds of bands that just saturated New York.